Digitized photographic images of the Moon taken from Earth with telescopes, from spacecraft orbiting the Moon, from astronauts and their equipment on the lunar surface, and by spacecraft flying by the Moon, plus digital images taken by spacecraft exploring the Moon. LPI’s Atlas of Lunar Sinuous Rilles illustrates 195 lunar sinuous rilles on the nearside and farside of the Moon. This atlas provides an interface with which all sinuous rilles can be observed in geographic context with Lunar Reconnaissance Orbiter Camera’s (LROC) Wide Angle Camera (WAC) image mosaics of various hemispheric views of the Moon. Furthermore, this tool provides access to additional geographic information and a high-resolution (6 m/pix) Kaguya Terrain Camera (TC) image of each sinuous rille. LPI’s Lunar Sample Atlas provides an easily accessible library of images of the Apollo samples taken in the Lunar Sample Laboratory, full-color views of the samples in microscopic thin-sections, cutting views and diagrams that illustrate how the samples were subdivided for scientific analyses, and in situ views of the samples on the lunar surface. The atlas contains information about the type of sample (e.g., rock, soil), the lithology (e.g., basalt, norite), and a description of the sample. Links to additional information about each sample are provided for those that have been previously described in The Lunar Sample Compendium and Lunar Sample Catalogs. Version 1 of the atlas is being released in August 2009. The process of scanning lunar sample images continues and the atlas will grow in the future. This atlas of Lunar Surface Flyovers provides a series of digital movies that allow viewers to fly over the dramatic terrain of the lunar surface. The spectacular landscapes revealed in this atlas provide scientists with another tool to study the geology of the lunar surface. They also provide mission planners with another tool to select landing sites and design robotic and crew traverses. This is a “living” atlas. As new spacecraft missions generate additional flyovers, those digital movies will be added to the collection. The LPI Clementine Mapping Project is an on-line tool for users wanting to generate maps of the lunar surface and its composition using data from the Clementine mission. The Clementine mission (1994) was a technology demonstration mission that produced nearly 1 million ultraviolet to visible wavelength (UVVIS) images, over 600,000 high-resolution CCD images, over 300,000 near-infrared images, and additional topographic details of the lunar surface. This tool seamlessly combines the data so that users can generate their own image mosaics, chemical maps, and topographic maps of any region on the lunar surface. The Lunar Orbiter Photo Gallery is an extensive collection of over 2,600 high- and moderate-resolution photographs produced by all five of the Lunar Orbiter missions. These photographs were taken in 1966–1967 to survey possible lunar landing sites and provide baseline imagery for geologic analysis of the lunar surface. The images were used to select the Apollo landing sites and to produce many of our existing lunar geologic maps. This photo gallery is the web's most comprehensive collection of Lunar Orbiter photographs and supporting mission documents. Digital Lunar Orbiter Photographic Atlas of the Moon by Bowker and Hughes (NASA SP-206) is considered the definitive reference manual to the global photographic coverage of the Moon. The images contained within the atlas are excellent for studying lunar morphology because they were obtained at low to moderate Sun angles. The digital Lunar Orbiter Atlas of the Moon is a reproduction of the 675 plates contained in Bowker and Hughes. The digital archive, however, offers many improvements upon its original hardbound predecessor. Multiple search capabilities were added to the database to expedite locating images and features of interest. For accuracy and usability, surface feature information has been updated and improved. Finally, to aid in feature identification, a companion image containing feature annotation has been included. The symbols on the annotated overlays, however, should only be used as locators and not for precise measurements. More detailed information about the digital archive process can be read in abstracts presented at the 30th and 31st Lunar and Planetary Science Conferences. The Consolidated Lunar Atlas by Gerald P. Kuiper, Ewen A. Whitaker, Robert G. Strom, John W. Fountain, and Stephen M. Larson is a collection of the best photographic images of the Moon. These digital renditions were created and edited by Eric J. Douglass. The Apollo Image Atlas is a comprehensive collection of Apollo-Saturn mission photography. Included are almost 25,000 lunar images, both from orbit and from the Moon's surface, as well as photographs of the Earth, astronauts, and mission hardware. The Lunar Map Catalog is a collection of topographic, geologic, and shaded relief maps and charts of the Moon in a variety of scales. The collection includes the USGS Geologic Atlas of the Moon, Lunar Chart (LAC) Series, Lunar Earthside, Farside and Polar Chart (LMP) Series, Apollo Intermediate Charts (AIC), Lunar Photomaps Traverse Charts, and the more recent Lunar Topographic Orthophotomap (LTO) Series. 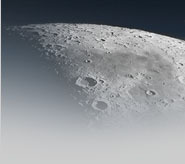 Ranger Photographs of the Moon is the online version of the NASA documents on the 1964–1965 NASA Lunar Ranger Program. It contains selected Ranger 7, Ranger 8, and Ranger 9 mission images and documentation from the photographic edition of the following Ranger publications. This web site provides an ArcGIS system with co-registered base maps (e.g., topography and FeO abundances) and a series of feature layers (e.g., for volcanic rilles and ≥20 km-diameter impact craters) relevant to the South Pole-Aitken Basin. This on-line atlas was prompted by the National Research Council’s 2007 report, The Scientific Context for Exploration of the Moon, and the National Research Council’s 2012 report Vision and Voyages for Planetary Science in the Decade 2013–2022, both of which suggest sample return missions to the South Pole-Aitken Basin.